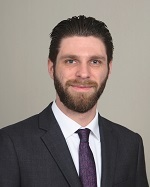 Hunter received his Bachelor’s degree in Legal Studies from the University of Massachusetts, Amherst and his law degree from Suffolk University Law School in 2018. During undergrad, his studies heavily focused on mediation and dispute resolution, where he explored new methods and technologies that helped effectively resolve impasses. While in law school, he participated in Suffolk’s clinical program defending Indigenous People’s Rights in the New England area. As a member, Hunter defended the rights of unrecognized indigenous tribes, consulting and working with them on how to most effectively preserve their traditional values and goals. Hunter is licensed to practice in Florida and works in our Miami/Ft. Lauderdale office.